Being someone who works with your hands, you probably need tools. After all, you can’t screw in screws, cut wood, or tighten bolts with just your bare hands. You need a good set of tools to be a true hero in your profession. That being said, tools are not the only thing you need. You probably need a good tool chest, box, or cabinet to keep those tools in. There is nothing worse than needing a certain tool but not being able to find it or have it on site. There are a lot of things which a good tool chest can do for you. Of course, finding the right tool chest or cabinet for your needs is not always that easy. However, that is why we are here today. We have 2 awesome products we are about to compare with the aim of figuring out which one is better for you. So, let’s get on with this Milwaukee Tool Chest vs Craftsman comparison to see what we are up against. Both the Milwaukee tool chest and Craftsman tool chest which we are here to look at today are great options for many different people and professions. Whether you are a carpenter, mechanic, plumber, repairman, or are just an at home handyman, you need a place to put your tools. You need a place to keep your tools, to keep them safe, to keep them organized, and probably something that is portable too. Well, that is exactly what both the Milwaukee tool chest and Craftsman tool chest are, albeit they are quite different in their own right. Like we said, we are here today doing a Milwaukee tool chest vs Craftsman tool chest comparison. Of course, we need to know exactly which points to compare before we get started, something you would probably like to know as well. There are a few specific aspects that we are going to looking at during the comparison. We are focusing on 4 main aspects including durability and material, the weight, the drawers and capacity, and the mobility of each of the tool chests. The first aspect that we want to look at is how durable the tool box in question is. Knowing what a tool chest is made of, how tough it is, and how much beating it can absorb are always important things to know. After all, you need the tool chest to last for many years to come. Longevity and durability are key factors when it comes to these things. 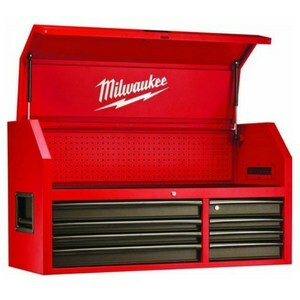 If there is one thing that can be said about the Milwaukee Rolling Cabinet set is that it is definitely very durable. When it comes to tool boxes and tool chests, you will be hard pressed to find something more durable than this item right here. It is made out of thick steel in order to make sure that it does not bend, get dented, or come apart in any other way. This big guy is made out of real steel and that is all that matters. It also comes with a specialized powder coat finish for added protection. Stripping, chipping, or scratching the Milwaukee Rolling Cabinet Set is not easily done! It can handle an astounding 1,800 pounds of tools without flinching. The Craftsman Tool Chest is also made of steel, but it is not quite as thick. Also, it does come with a powder coat finish, which is always nice. The fact of the matter is that the Craftsman is much smaller and does not need to handle as much weight, therefore it does make sense that it is made with lighter steel. 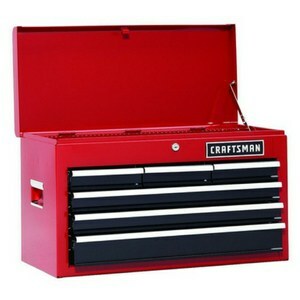 For a small tool chest, the Craftsman is very durable no doubt. The winner of the durability battle is the Milwaukee. Simply put, it needs to handle more weight and is therefore made of stronger steel. While the Craftsman is also very durable, it is much smaller and does not need to handle as much weight and is therefore less durable when directly compared. We like to compare the weight of tool chests when pitting them against each other. Keep in mind folks, you are going to be using these things to carry around heavy metal tools, so the chest itself being lightweight can be helpful. However, also keep in mind that some chests are meant to be stationary, or mostly stationary, and can therefore afford to be a little heavier. There is no doubt about the fact that the Milwaukee is really big and heavy. It is much larger and has a much higher capacity for tools than the Craftsman. This bad boy comes in at close to 400 pounds, making it very heavy indeed. That being said, the top chest portion of the Milwaukee can be removed from the bottom cabinet part, which is OK for portability’s sake. All in all, this thing is very heavy, even the top half is still quite substantial in weight. The Craftsman Tool Chest is the exact opposite. It only weighs slightly under 20 pounds, which is very lightweight. It is definitely a tool chest designed to be portable and easy to move around. It may not really have any good carrying handles, but it is much lighter than the Milwaukee. There is no real clear winner here. Yes, the Craftsman is much smaller, lighter, and more portable, but it was built to be just that. The Milwaukee is much heavier, but it was also designed to be used in one place as opposed to moving from one jobsite to another. If you want a lightweight option, the Craftsman is the way to go. These are chests and cabinets intended to hold tools, so it is only fair that we compare how much each of these can hold. Keep in mind that they were designed for slightly different purposes when taking a look at the capacity. The Milwaukee is a really big tool chest and cabinet combo, so it does have a whole lot of capacity for tools. The top chest half has a lot of space under the lid for power tools and other items, plus it has 8 small drawers, 4 of which are wide and 4 of which are narrow. The bottom half, the cabinet, has another 8 drawers. The drawers are mostly different shapes and sizes with the largest one being easily big enough to fit some power tools. The drawers themselves are set on ball bearing slides for smooth operation, plus each drawer can hold a whopping 100 pounds. The Craftsman Tool Chest is the opposite thing here. It is a fairly small tool chest, which is great for portability, but not so much for storing a lot of big tools. It comes with 3 drawers and some space under the lid. The drawers are big enough for some small parts, hand tools, and things like ratchet sets and screwdriver sets. However, you definitely will not be fitting any big power tools into this thing. The drawers are set on smooth glide ball bearings, but they do not have a very high weight capacity. When it comes to overall capacity, the Milwaukee is the clear winner here. It is much larger and can store a heck of a lot more tools than the Craftsman. That being said, this means that the Craftsman is also much better suited for being on the go. The final aspect we want to compare is how mobile and portable each of the chests are. It is important for you to consider whether you will just be using the tool chest at home or if you need it on the go. Ok, the Milwaukee weighs close to 400 pounds and is massive, which means that it is not really all that portable. However, the bottom cabinet can be detached from the top tool chest, which then makes it fairly portable. The bottom cabinet does also come with wheels and a handle for moving it around the shop. The Craftsman is small and lightweight, making it the much more portable option. However, it does not come with any real carrying handle. The winner here is the Craftsman. While the Milwaukee does have the separation feature which makes it portable, the top chest is still bigger and heavier than the total weight and size of the Craftsman. As you can see, this Milwaukee Tool Chest vs Craftsman comparison is slightly inconclusive in the sense that there is no real winner. Yes, the Milwaukee is much bigger, tougher, and has a higher capacity. On the other hand, the Craftsman is much lighter and more portable. At the end of the day, these two tool chests were intended for different things. 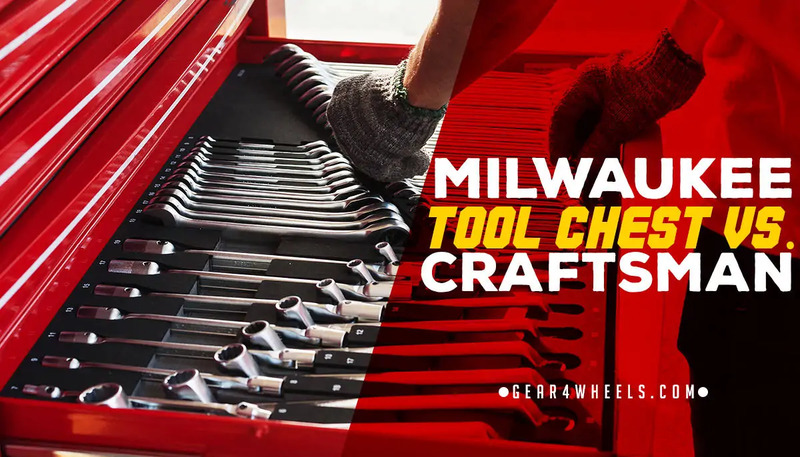 The Milwaukee is better for in-shop or at-home use and the Craftsman is better for being on the go.